(battery additional: takes BCI group U1, 12V, 235 cca). APPLICATIONS: Mobile 45KW / 56 KVA power generator is trailer mounted with an ultra efficient and reliable Iveco (Fiat)diesel engine. Ouputs up to 150 amps. Multi-voltage outputs with 120V, 208V, 240V, 277 and 480V outputs. Designed for daily use by all trades. 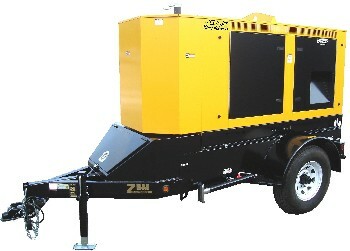 Efficient diesel engine and 110 gallon tank runs 39 hours at full power output and 79 hours in half-power mode. 45 KW output power rating ! One year Winco warranty on generator. Two year Iveco motor warranty.